We have a new challenge over at StampARTc. This time, the challenge is to use a coloured motif. I created a different card for a baby boy. 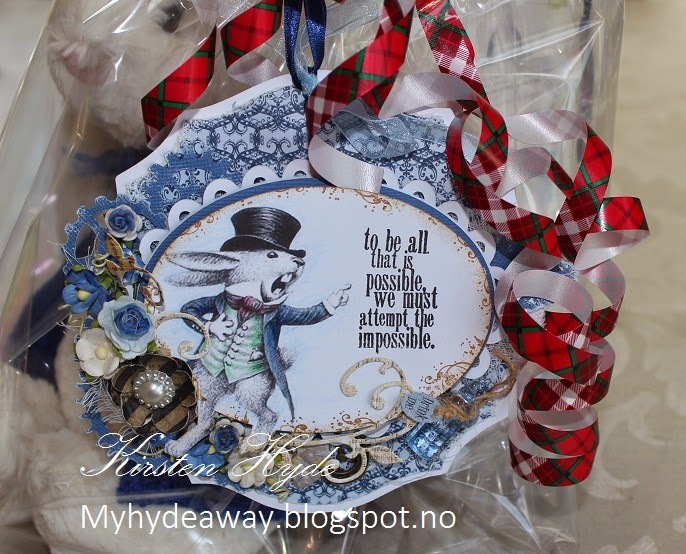 I wanted an Alice in Wonderland inspired card, to go with an Alice in Wonderland inspired gift. 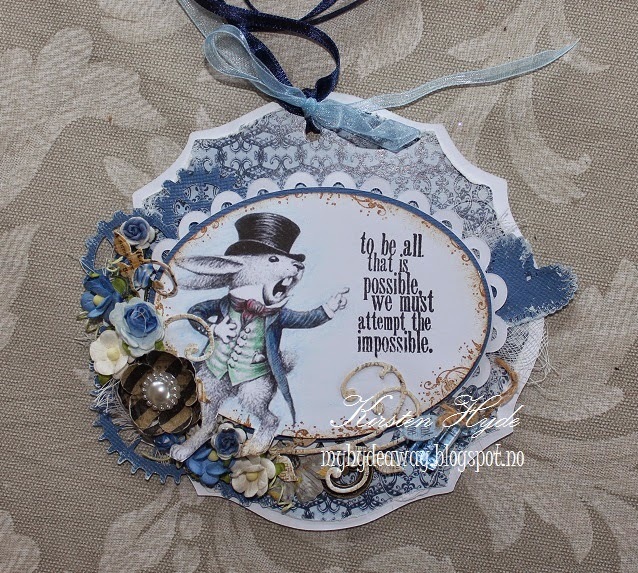 I used a vintage Alice in Wonderland motif from Nicecrane design, coloured with Prismacolours. 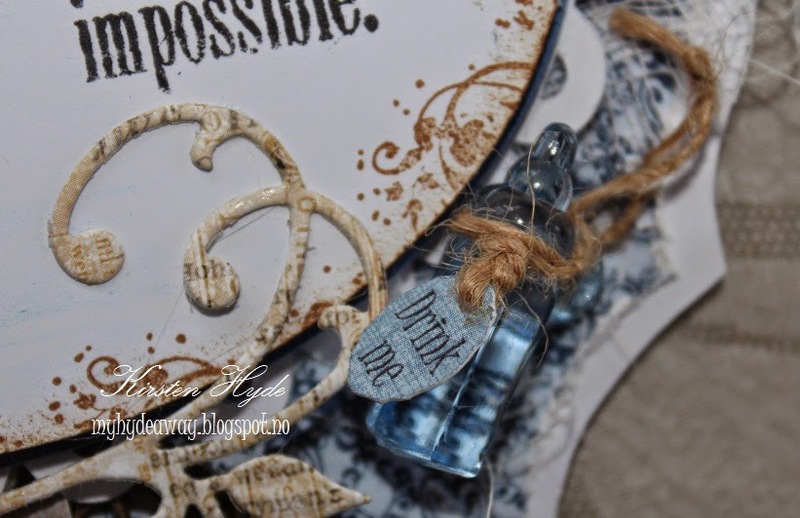 The text is a clear stamp from Tim Holtz, Visual Artistry Clear Stamps -- Life's Possibilities.The background paper is from Maja design, Vintage Autumn Basics collection. I have also added gears and heart die cuts, made from blue bazzill and added white paint for effect. Flowers are from Prima and Wild Orchid. 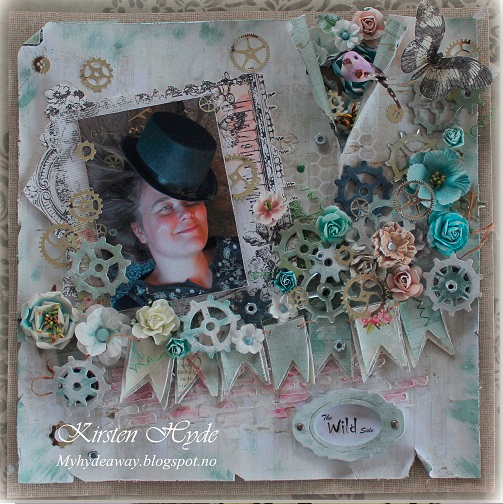 I have used a Swirl dies from Marianne design, Anja's vintage swirls. The clock charm is from Kort Hobby. I also added a small baby bottle, which I have altered a bit. I have also added the label "drink me" to the bottle. 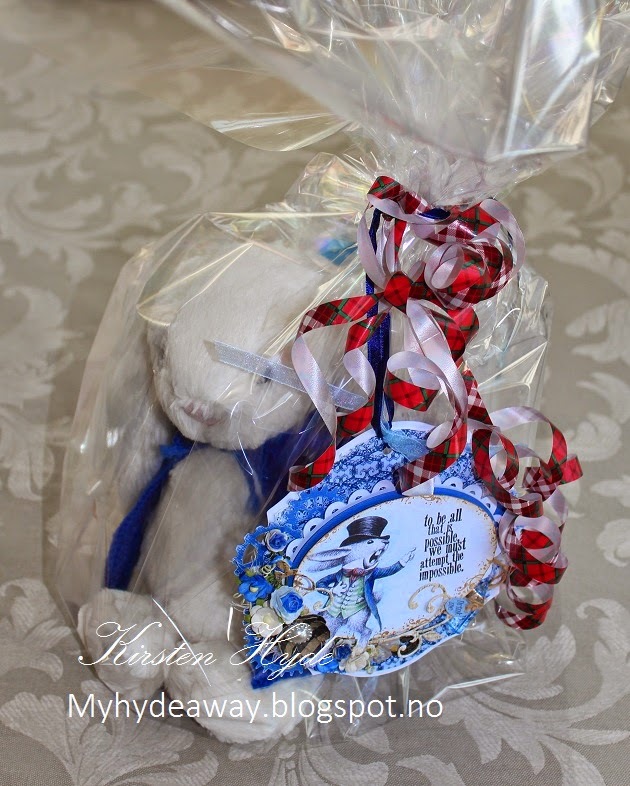 I also wanted the present to be "Alice in Wonderland" related. I got a baby bottle and added a "Drink me" label. 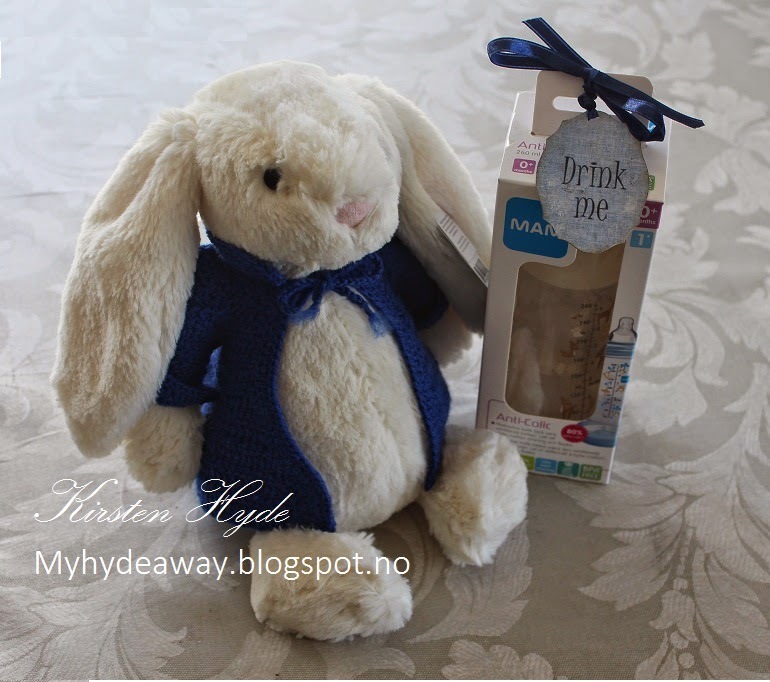 I found a white toy rabbit, and made a small blue jacket for it. 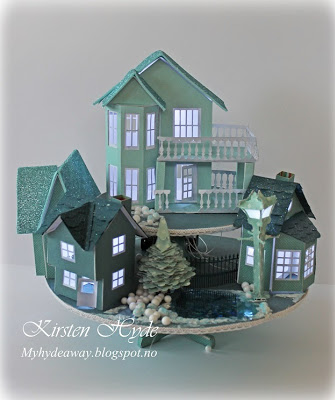 There is a new Scandinavian Challenge blog, starting in September: Scandinavian Paper Fun. The challenges is for anyone living in Norway, Sweden or Denmark. 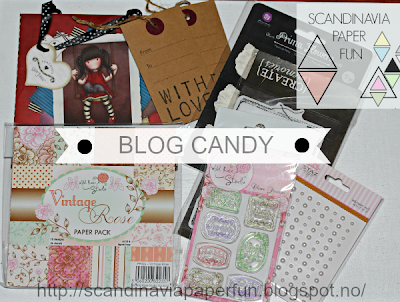 We are are introducing the Challenge Blog with a Blog Candy. 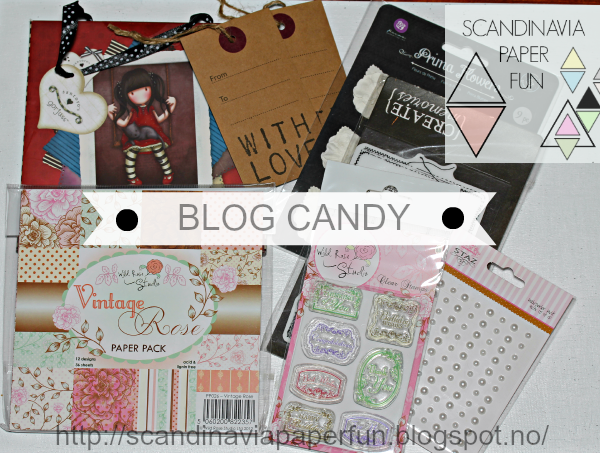 You have to live in Norway, Sweden or Denmark to be in the price draw: Since the blog hop - only is open to Scandinavia - the rest of the information about the blog hop, will be in Norwegian. 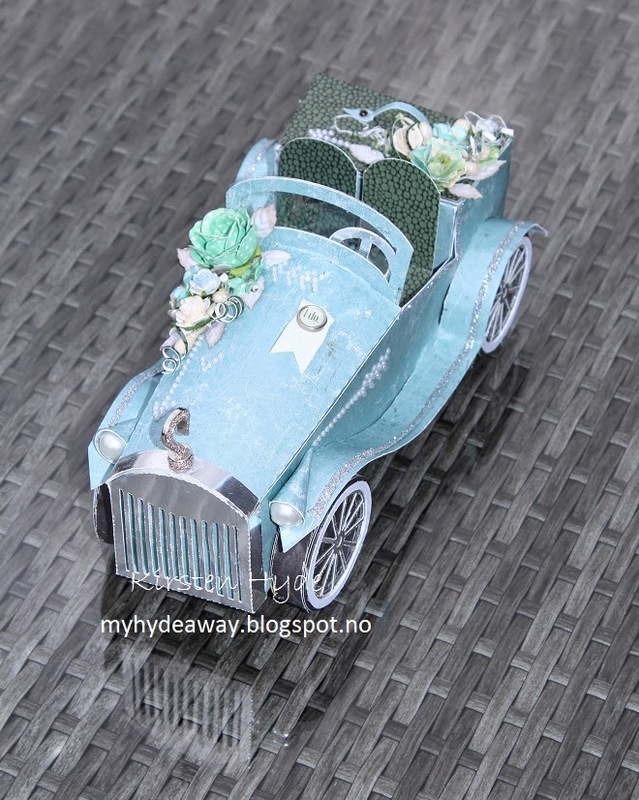 Wild Rose Studio mønsterpapirer 36 stk 6x6. Gorjuss mønsterpapirer 32 stk 6x6. "Du må bo i Norge, Sverige og Danmark for å være med på blogg Candyen"
BLOGG CANDYEN SLUTTER DEN 28 SEPTEMBER 2014 KL 12.00. 1. september starter utfordringene. Du kan delta med prosjekter som layouts, kort, bokser, tagger, art journal, project life og andre papirprosjekter. 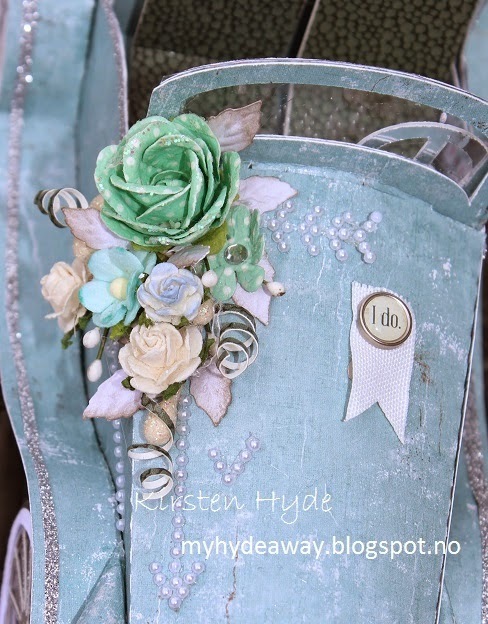 When creating, one can use lots recycled items. This time, I was challenged by StampARTic to create something with some old jewelery. 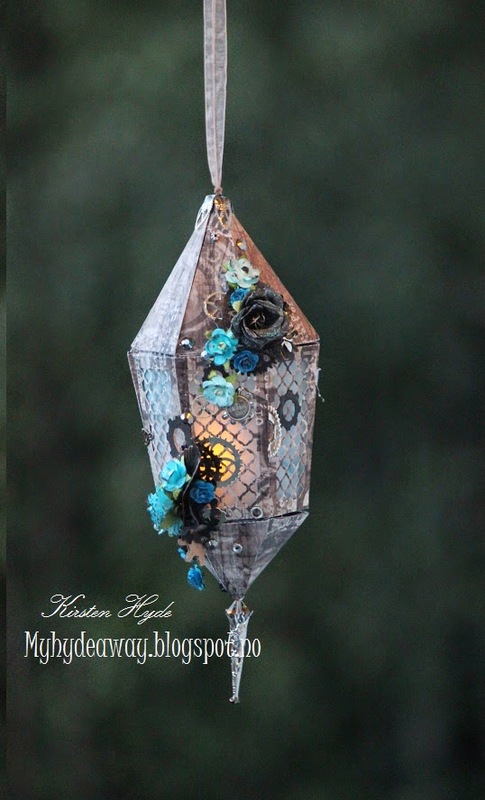 I used an old glass bead and metal from an old necklace and created a steampunk lantern. The lantern is a silhouette design by Gunn-Eirill. I have added the panels for the windows. 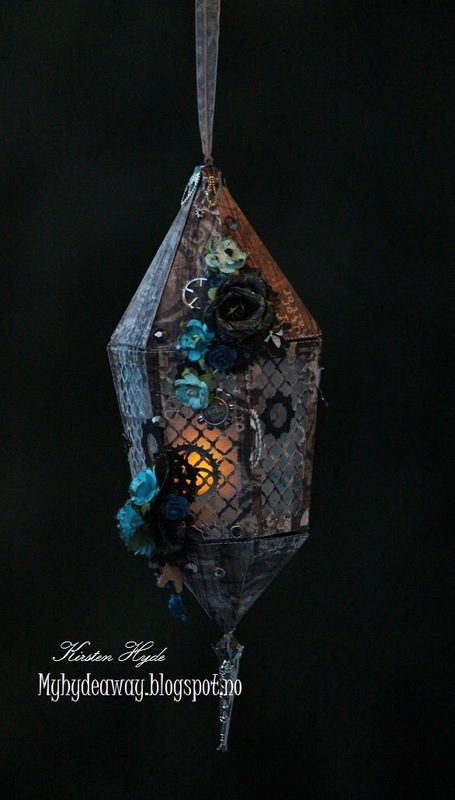 There is room for a battery operated tea light candle inside the lantern. 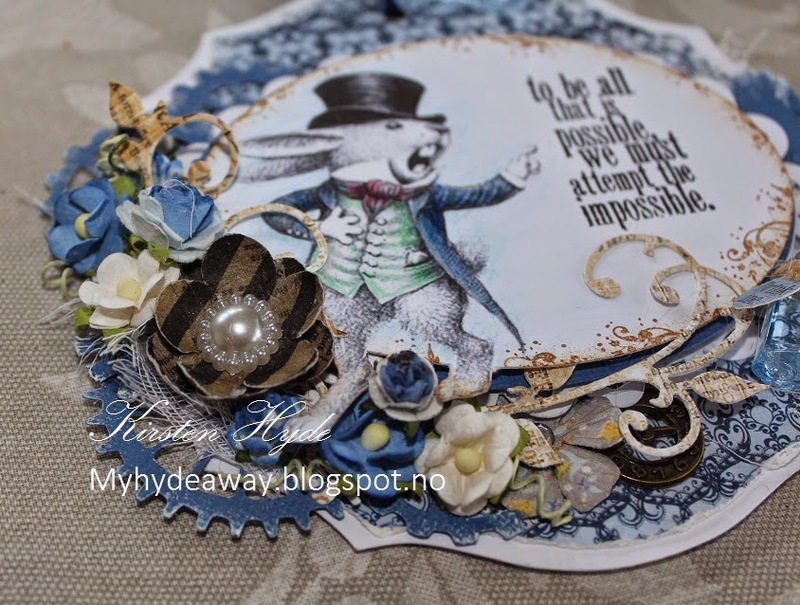 I was invited to a Creative Blog Hop by Maryann. This hop is about sharing a bit about oneself, and to show you some inspiring blogs. Maryann invited me to join a week ago, and wrote a bit about me in her blog. Maryann has been one of those who has visited my blog for a long time, and always leave comments, which I really appreciate. 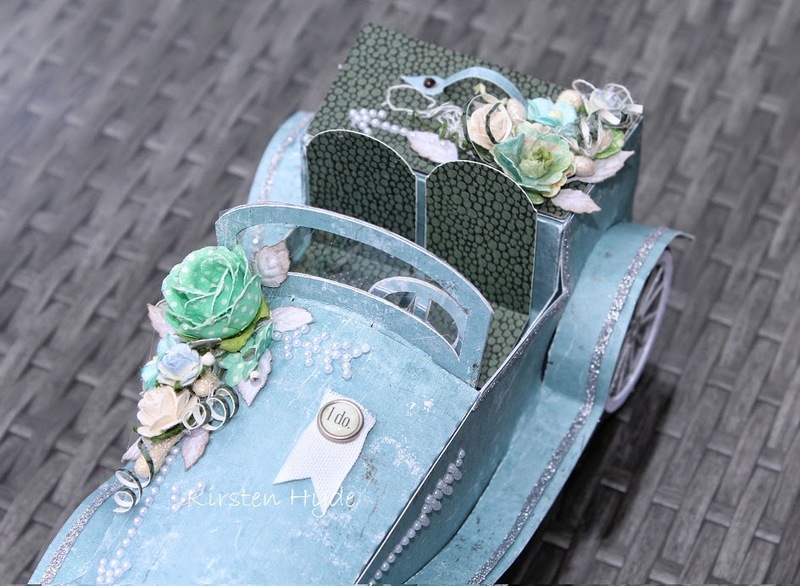 She is a devoted crafter, who makes cards, parchment cards, sewing and creating baskets, boxes and other paper crafts. So - What am I working on at the moment? 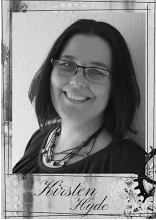 At the moment, I am preparing a few craft classes for a craft gathering in Kjøpsvik (Nordland), Larvik (Vestfold) and for Hobbykunst (Akershus). This is a Graphic 45 canvas I created in June. This was a DT task for Hobbykunst with brand new G-45 papers in the shop. I will give classes in this soon. Here is a Mixed Media canvas, which I will be giving classes in in Kjøpsvik at the end of the month, and class materials has just been packed. This Pop up album, is another class I will be giving in Kjøpsvik. I am currently working on the course material for this class. I also took a class with Andy Skinner a few weeks ago, and have started a project using some of his mixed media/Decoart techniques. 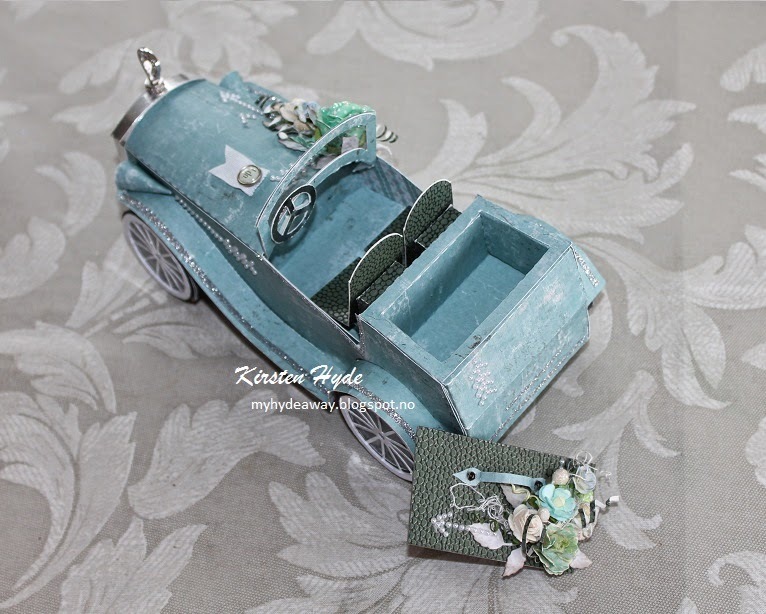 I am also currently working on a few DT projects and preparing for StempelScrapmessen, where I will be helping Hobbykunst on their stand with a few demos. Well - not telling more about this yet. What do I make, and what is my style? I love crafting. I am trying to create my own style, often on the borderline between Steampunk/Mixed Media and vintage. However, I do like to try new styles and different craft products. I often use a 3D element in my work and a lot of details. This was a canvas I made for Hobbykunst. Everyone in the Design team made a layout, that was would describe yourself. This canvas is on display at Hobbykunst. Graphic 45 box with cards. This was made with The Botanical Tea Collection from Graphic 45. 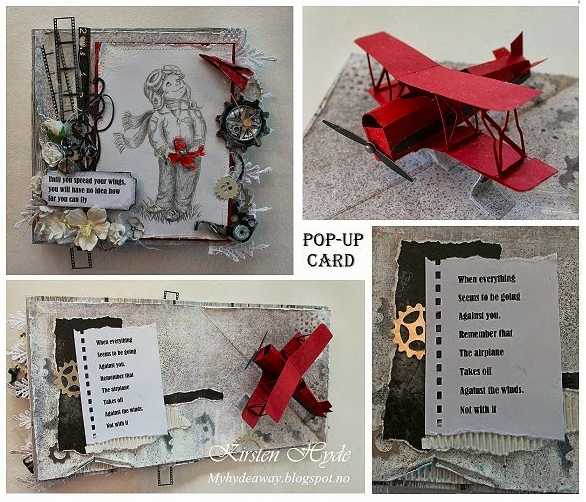 This is a pop-up plane card I made for the initial round of The European Scrap Battle last year. 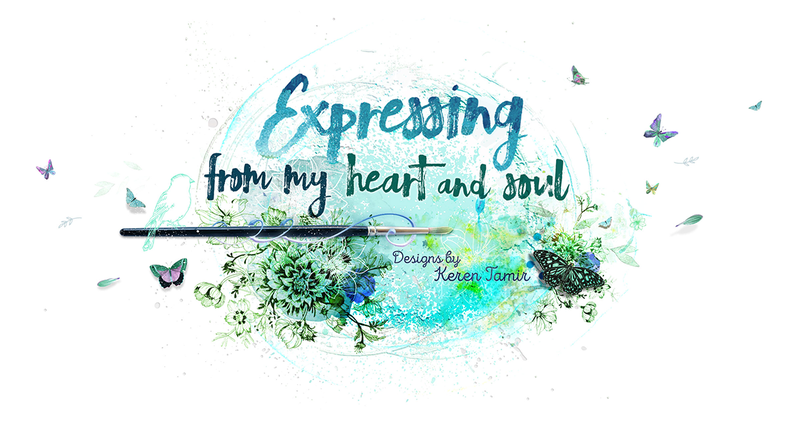 It was also my design team application for online craft magazine StampARTic. The plane is my own design (template in the blog). Christmas glitter houses. This was my semifinal contribution in alter for The European Scrap Battle. Alice in Wonderland clock. This was made as a task for Hobbykunst. 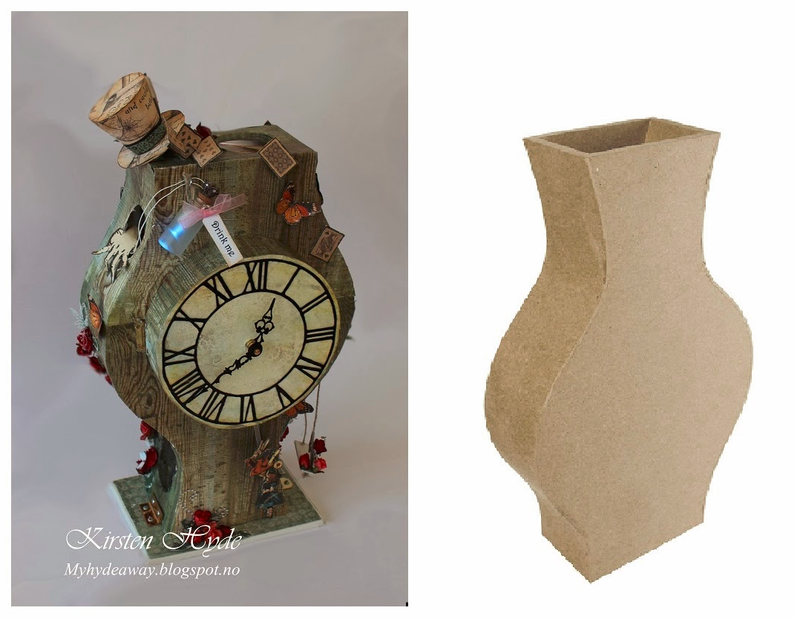 I was asked to alter an MDF vase, and I altered it to become a working clock, The clock is inspired by Graphic - 45's Alice in Wonderland. This clock is on display at Hobbykunst. This was a Mixed Media, made for Hobbykunst. It is currently on display in the shop. On the Wild side. 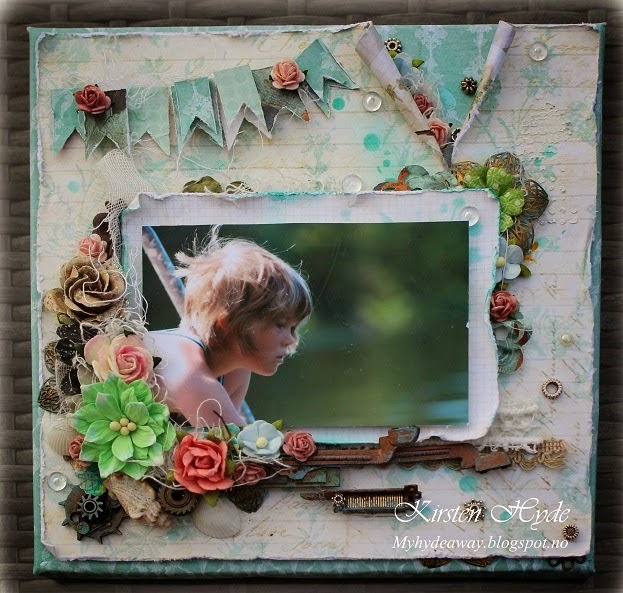 This was my first layout created for Hobbykunst. This is currently on display in the shop. 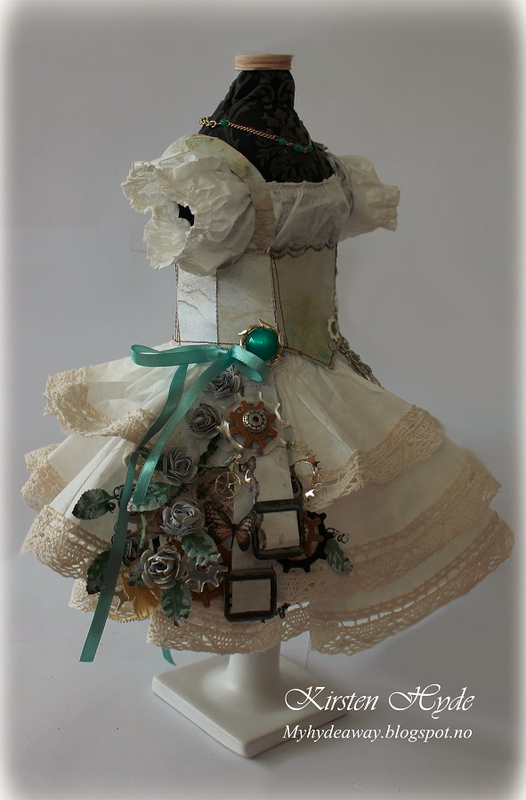 This is a handmade dressform with a Steampunk dress, I made a while ago. The dress is sewn from coffee filters. Creating is a lifestyle for me, and I have been doing this since I was little. I try to get some time for crafting each day. I also love to be able to teach and inspire others. I often start with a main idea. This could be the shape, the colour or just an idea of what type of art to make or what to decorate. Sometimes I have some guidelines, for instance a DT task, a demo or something for s specific art class. Other times, I might want to make something for a challenge or a competition - and would then have some guidelines for the work. I use a lot of time to develop the idea. I am not really a CAS girl, and my crafts could take a lot of time to finish.. I get a inspiration from a lot of places. 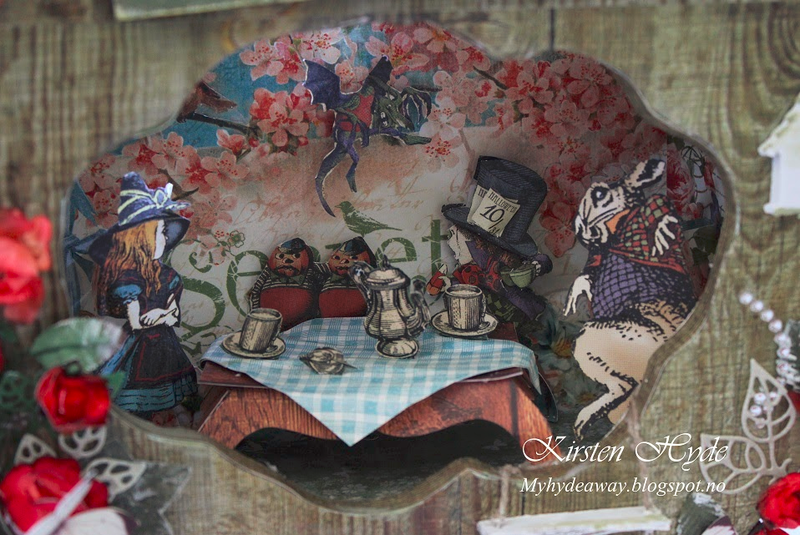 I could be going to an antique shop, on holidays, going through blogs (Pinterest), looking at papers, with paper crafting friends or just going to a craft shop. I have also done some classes to learn about new products and styles, and this is always inspiring. I would also like to introduce 3 friends, and their blogs. These are 3 people who I find inspiring. This is a really creative friend, and always inspire me a lot. 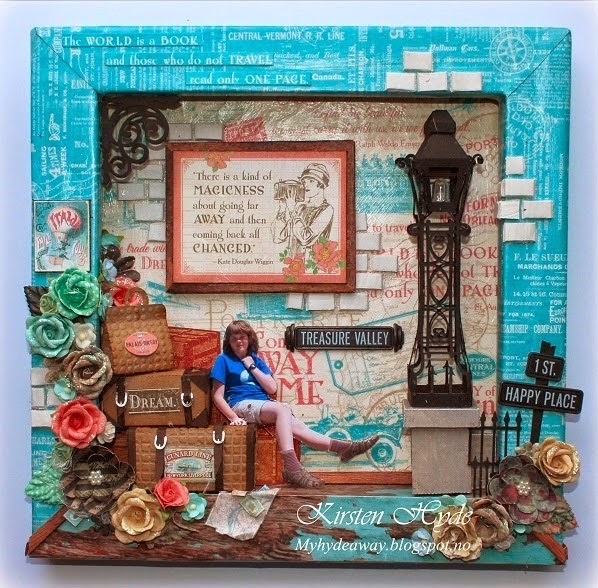 She is a super 3D artist, who really, really loves creating with papers from Graphic 45 (and Prima flowers). Her art is always very detailed. 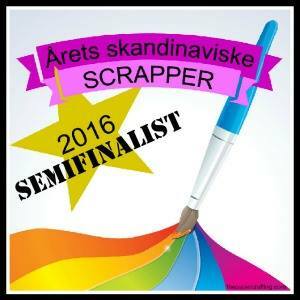 She was picked as one of 30 to to be on the last round of Graphic 45 Design team pick this year - and the only one from Norway. 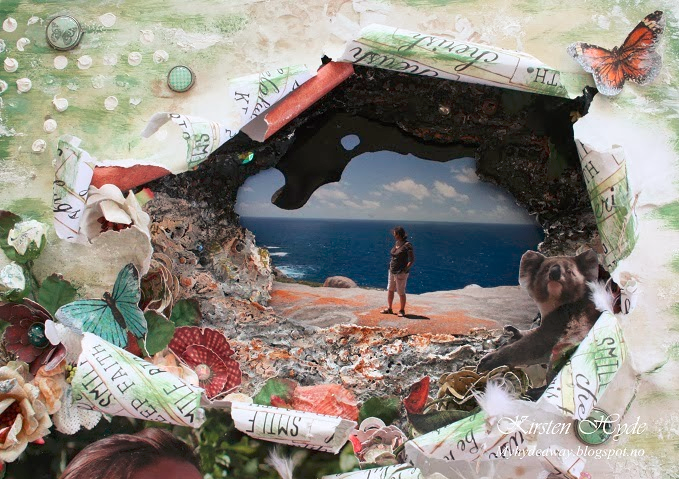 Laurie is a super 3D and Mixed Media designer from the US. Her art is always very detailed. I have been following here for a while, and she is always inspiring me a lot. 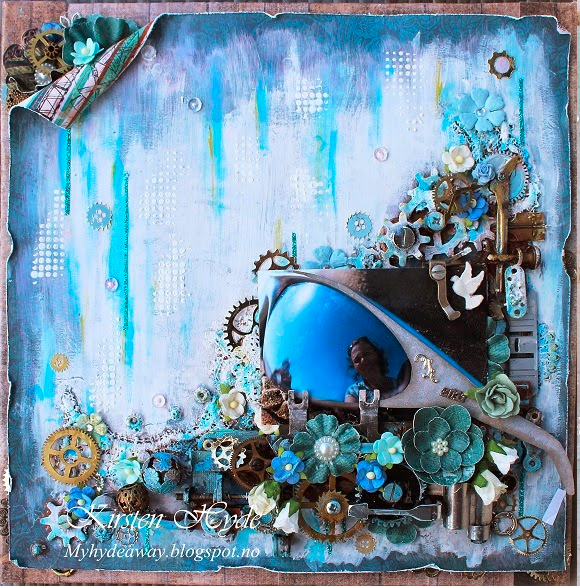 Stina is an artist i got to know through The European Scrap Battle. We were against each other in the semifinals in alter. 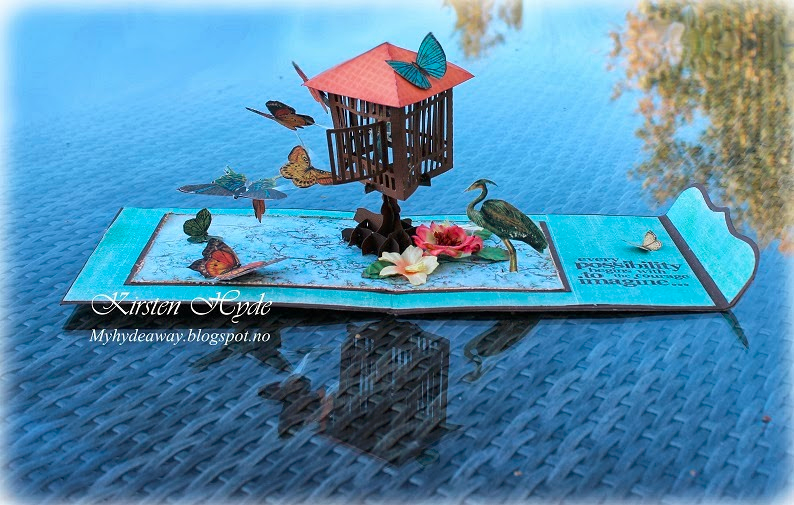 After this, we have kept in touch, She is also doing an online craft magazine, and organize craft gatherings, like me..She is a great paper artist, with lots of details, and always very inspiring. In May 2011, I made a vintage vauxhall car with a rubber band engine. The car was built as an example of how to make a rubber band engine for kids. 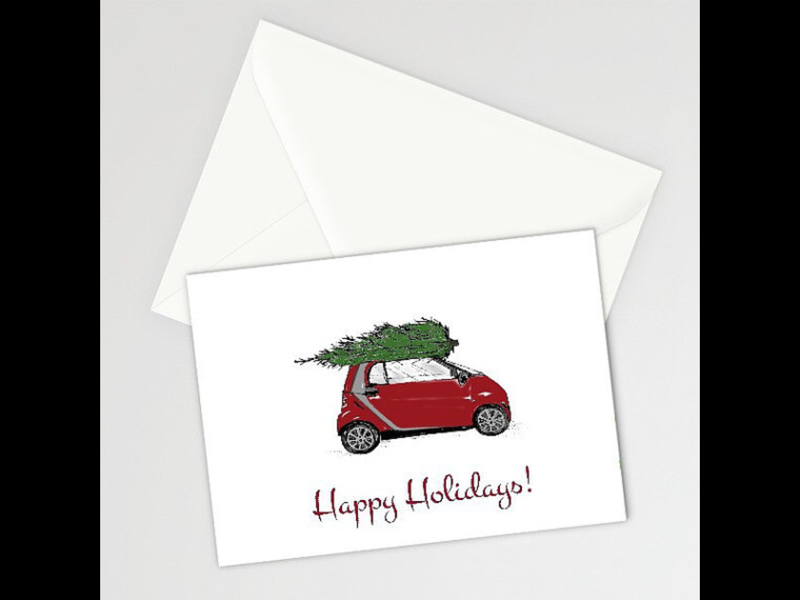 The car was then gives as a wedding card(d) for a friend who sold cars. It was important to me, that the car was similar to a real vintage car, therefore the car was made by looking at photos of real and toy vintage vauxhall cars. The blogpost with this car has had more than 5500 hits on my blog - and the blogpost which still have most visitors - 3 years later. 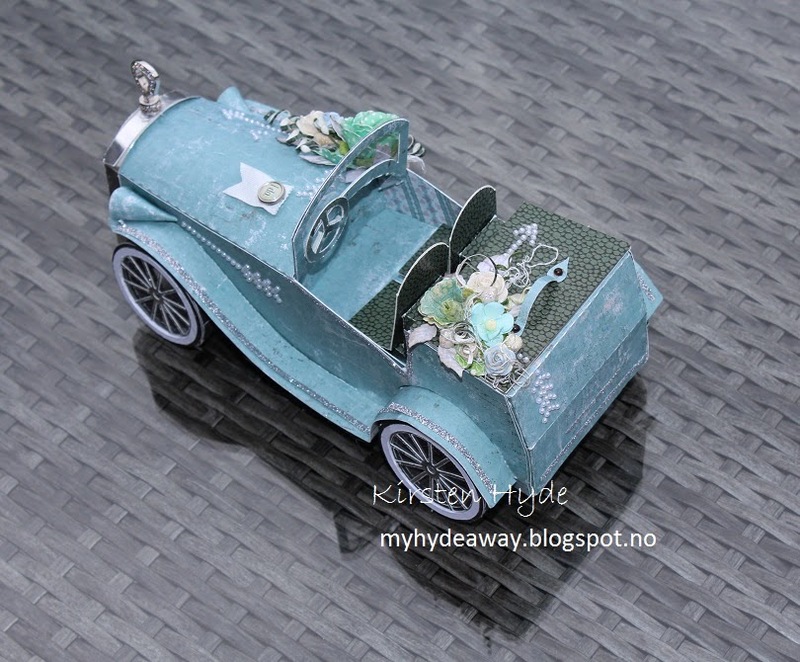 I used papers from Maya design, Vintage summer basics, for the car. The seats and lid for the boot is made with paper from DCWV, the textures and finishes stack. Leaves are made with a Nellie Snellen Leaf Punch and emboss. The leafs have been distressed with distress ink. 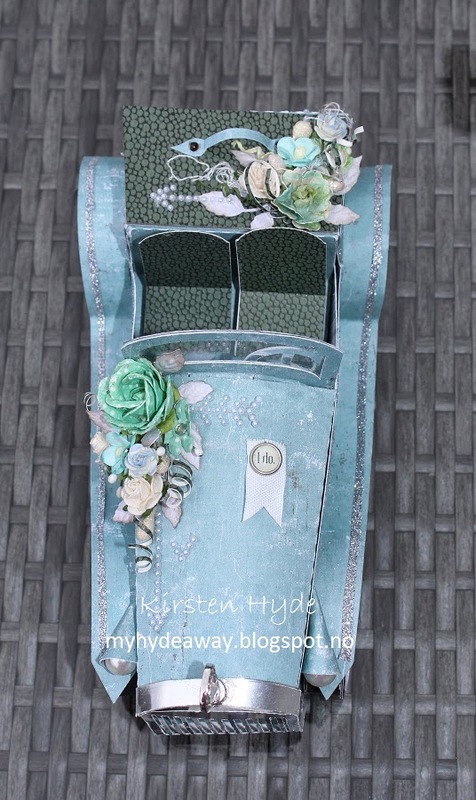 Flowers are from Prima and Wild Orchid Craft. 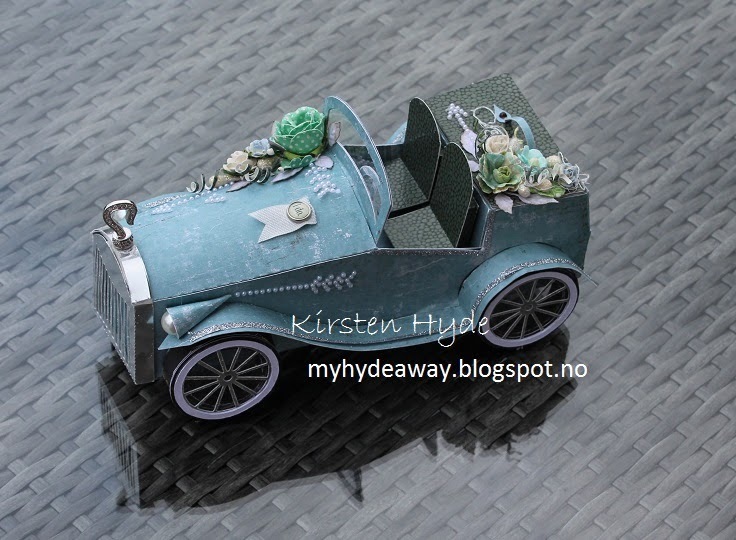 I have also used strips of silver tape from Søstrene Grene. The boot of the car is the same as the earlier version of the car, but I have added a lid, so the car is also functions as a small box with room for a treat. 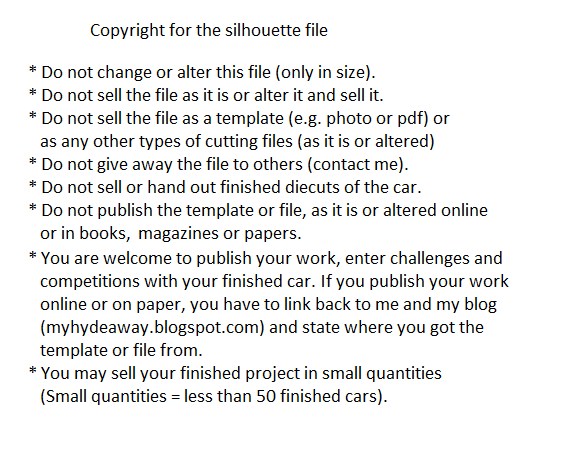 If you would like the silhouette file, please contact me.